Presented is an early classic binnacle with a rarely seen mushroom style twin burner hood which was popular on sailing vessels of the Mid 1800's. The mushroom style hood has its original twin lamp burners in towers, one on each side of the hood. The compass is viewed though an elliptical glass opening secured by a rolled metal rim . Arms on either side hold twin iron balls called quadrantal correctors, which have been copper plated for appearance. The use of correctors was invented by James Thomson, later Lord Kelvin in the 1870's to reduce the affects of the ship's magnetic field (deviation) on the compass. The compass has a very old style card which is only marked in Compass Points. It is lighted at night by the original Barton Burners which are marked Birmingham which is in England. PROVENANCE: The prior owner purchased this binnacle 36 years ago in New York, and was told that it came from a Portuguese naval vessel that was captured by the British 150 years ago. The British were said to have renamed the ship HMS Inverness. The ship was eventually iron clad and eventually stripped of its gear and sank in South America. Some of its gear was brought to the United States. In this process the original compass was lost. There is no documentation supporting this, and we can not find any record of an HMS Inverness. 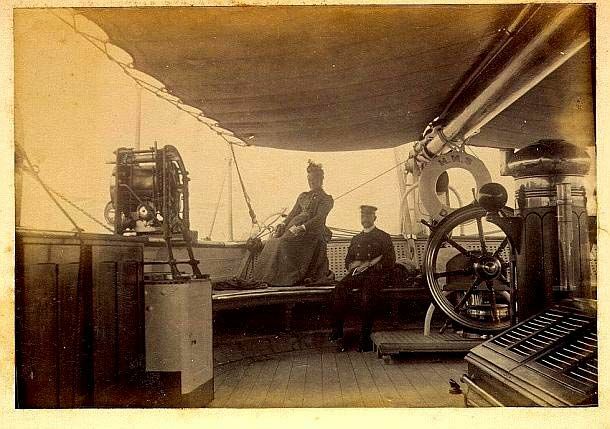 However, the binnacle speaks for itself, and one very similar was fitted to HMS DART in service from 1860 to 1884 and is pictured below. Note that in DART"S case a Flinders tube to hold the bar is fitted on the back of the binnacle, and the lamps are missing from their holders. Furthermore, the construction of this binnacle clearly indicates it was not originally intended for a metal clad vessel since there are no internal magnets or a Flinders bar, and the quadrantal corrector brackets look like a later addition. The compass in this binnacle is a later version of what was likely installed originally. It is the famous James Thomson - Lord Kelvin, threaded compass card that was introduced around 1870 with the assistance of James White. Kelvin & James White collaborated under a number of business names and in 1913, became Kelvin Bottomley & Baird Ltd. In 1947, they merged with Henry Hughes & Son forming Kelvin & Hughes, Ltd. This one is marked Kelvin & Hughes, Ltd within the north pointing Fleur de Lis, and Kelvin Bottomley & Baird Ltd on the bottom of the white paper insert. 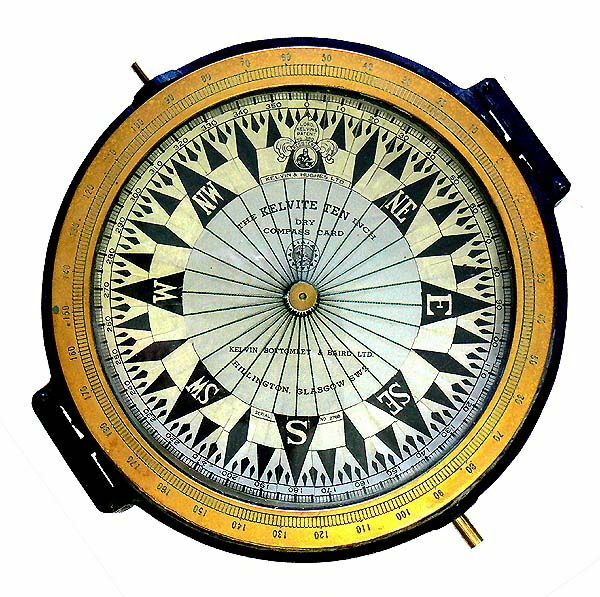 Compasses like this are very rare, and command premium prices. THE CARD: The appropriate compass has North marked by an elaborate Fleur de Lis, marked Lord Nelson Patent, as the North pointer on a curved ring. The compass rose shows the eight cardinal points and is further divided to 1/16 points and then to 32. It measures 10 inches in diameter and has a brass center housing with a gravity fit. Degrees are indicated on the outer perimeter from 0 to 359, and are again inscribed on the compass' bezel. The construction is of paper and thread which are glued together forming the card. This simple arrangement makes the compass have a sensitive gimbal action, and when placed on the top of a pencil and tipped, the compass will rock for several seconds while it seeks North and comes to rest! CONDITION OF BINNACLE: Considering its age and use at sea for many years, this handsomely made antique binnacle with its impressive spun brass mushroom style hood is in excellent condition overall. Expect to find some dents on the hood and the right burner holder has two age cracks in the metal. One problem which may bother some people wanting perfection is that the hood does not fit the lower section properly. It does not seat down as far as it should or turn once in place. The quadrantal correctors which have been clad in copper over iron are not believed to be original. The Barton burners are complete, but have not been tried. They should work when wicks and kerosene are added. Both have had repairs made to their chimneys. The compass is in sound working order. All surfaces have been polished some time ago and have a subdued patina. Overall height 59 3/4" Maximum width 25 1/2"
This important binnacle is an outstanding example of an early design. It is an excellent addition to a nautical collection of only the rarest. corrector brackets look like a later addition. THE CARD: North is marked by an elaborate Fleur de lis as the North pointer. The compass rose shows the eight cardinal points and is further divided to 1/16 points and then to 32. It measures 10 inches in diameter and has a brass center housing with a gravity fit. Degrees are indicated on the outer perimeter from 0 to 359, and are again inscribed on the compass' bezel. The construction is of paper and thread which are glued together forming the card. This simple arrangement makes the compass have a sensitive gimbal action, and when placed on the top of a pencil and tipped, the compass will rock for several seconds while it seeks North and comes to rest! should work when wicks and kerosene are added. Both have had repairs made to their chimneys. and have a subdued patina. cost of shipping, packaging and handling unless we are at fault. United Arab Emirates, USVI and the Eastern Caribbean. shipment, he shall hold seller harmless for any damages or loss arising out of their participation. buyers, no credit cards or PayPal accepted on this item. excellent addition to a nautical collection of only the rarest.